We are delighted to announce that we have been awarded UNICEF's Rights Respecting School Silver Award. Well done to the entire school community for helping us achieve this accolade. It was back in September 2014, that we began working on the UNICEF Rights Respecting School initiative and the 54 articles included in the United Nations Convention on the Rights of the Child (UNCRC). UNICEF is the world's leading organisation working to protect and promote children's rights. 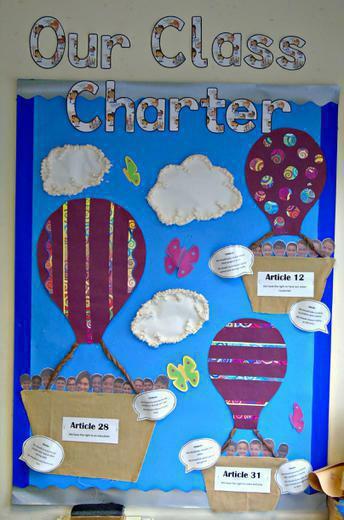 A Rights Respecting School puts the UNCRC at the heart of their planning, policies, practice and ethos to enable all children to develop their talents and abilities in order to achieve their potential as global citizens. 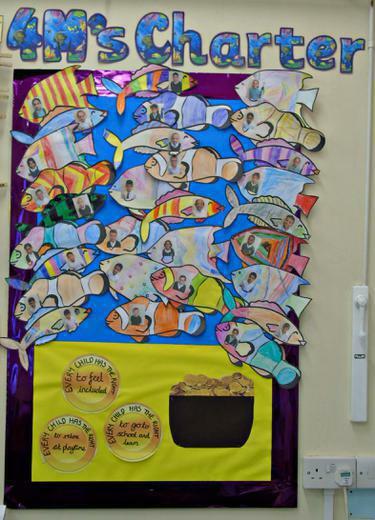 We believe that the UNCRC reflects the beliefs of our school community that our children receive their right to a wonderful education and understand the responsibilities that they have to their communities as they grow into confident, active and responsible citizens. Our children will continue to learn about the rights and responsibilities as well as the work of UNICEF in helping to build a better world for children. We were pleased to announce at the end of the summer term, in July 2015, we received the UNICEF UK Rights Respecting School Award Recognition of Commitment for our work exploring children's rights across the world. Pupils have displayed great interest and empathy in exploring the different articles of the rights and this has led to many creative outcomes. This recognition shows that we are committed to becoming a rights-respecting school and that it is at the heart of our school's ethos. You can view the photographs from our Rights Respecting Assembly here. 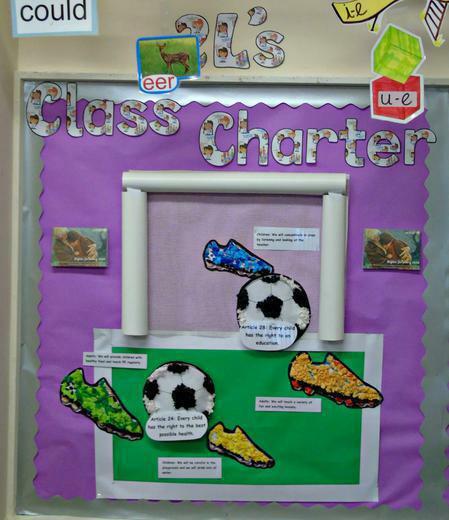 During an assessment visit in November 2016, two assessors evaluated the School's provision; talking to staff, children, parents and governors as well as reading through a host of documentary evidence we had provided to support our application. At the end of a very long day for Miss Wakefield and Miss Simmons, we were told we had more than met the standard and given some areas to work on in order to achieve Level 2, UNICEF's highest award for work in this field. 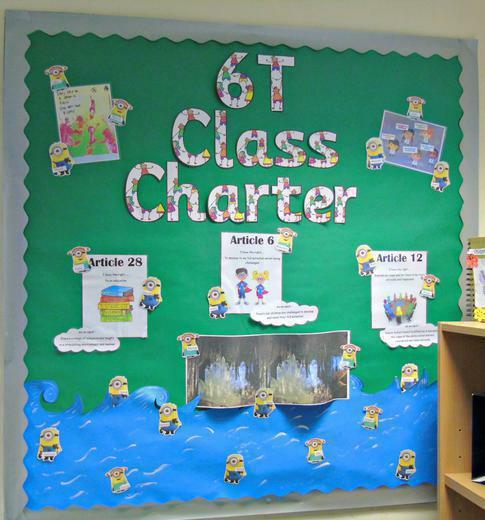 Throughout the scheme, the children have been following a journey learning about the ‘Rights of a Child.’ They have been working in conjunction with their amazingly talented adults to create their own class charters which highlight what the class deem to be the most important Rights for their classroom. 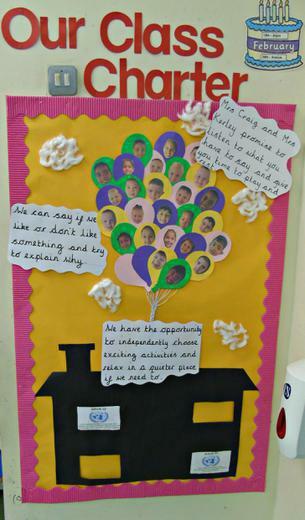 These are individual to each class and have been designed by the children for themselves. If you look closely you might spot your child as a Pokemon, a safari animal or even a Lego block!